“Even the most passionate man will go crazy in this city,” wailed cab driver Abdullah Ayaz as he stomped on the accelerator, swiped the shopping bag of a pedestrian and shot a glance at his crowded rear-view mirror. I asked Abdullah if he’d ever had a serious accident in his 11 years of maneuvering through Istanbul gridlock. He said he hadn’t. This is no small feat in a metropolis of over 13 million people and 2.8 million cars, where motorists regard an ambulance siren as a challenge to street race and a red light means proceed with caution. Indeed, life in the former Turkish capital has swerved like a taxi cab for 27 turbulent centuries, through sieges and conquests, around coups and over earthquakes, onto the hyperinflation highway toward modernity. While the city has always been on the verge of a big crash, today its hardy residents stick to a live-and-let-live attitude that suggests east and west can dance fluently, where neither partner is taken too seriously. 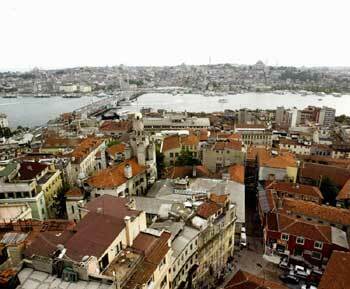 Istanbul is the only city in the world that can claim to sit on two continents. Roman Emperors and Ottoman Sultans, Barbarians, Arabs and Alexander the Great all fought fiercely to possess its strategic advantage. No matter what intrigues befell its shores, the Bosporus Strait has worked overtime as a trade conduit between the Black Sea in the north and the Sea of Marmara to the south. Each day an average of 130 vessels hustle cargo under the Bosporus Bridge, which connects the Asian and European sides of the city. The European side is sub-divided by the Golden Horn into Beyoglu and the historic Sultanahmet (old Istanbul), where the Aya Sofia, Blue Mosque, Topkapi Palace and other attractions are clustered around the ancient Hippodrome in a since forgotten paradigm of sound urban planning. To secure their hold, the city’s sundry custodians built underground cisterns, aqueducts and lavish palaces — and in the case of the Aya Sofia — a church on top of an acropolis and a mosque out of a church. The area boasts a historic tapestry that, layer by layer, has much in common with the Anatolian kilims and carpets stacked high in the grand bazaar — sometimes rough, at other turns smooth, often complex, rarely what you bargained for. Since the founding days of Istanbul, land-based merchants on the European side have plied their goods in the Kapali Carsi. The Grand Bazaar is a covered labyrinth of over 4,000 shops and stalls that will have you lost in its belly within moments. You can still find most anything, though these days it’s an erratic mix of authentic handicrafts and tourist kitsch. A century ago, Europeans began flocking to the bazaar to bring back exotic wares from the distant reaches of Asia. The Sirkeci train station, a stone’s throw from the Eminonu ferry port, was once the last stop on the famed Orient Express from Paris. This train no longer runs, but since the 1960’s the Cankurtaran area a few blocks uphill from the station has been a de facto base for the Lonely Planet set heading overland to Kathmandu. The Misir Carsisi (spice bazaar) is also a short walk away, and inside its aromatic passages you’ll pass by bold heaps of its namesake from outposts along the Silk Road: prized saffron from Iran and flame-toned curries from the subcontinent, as well as Caspian caviar, Algerian figs and Arabian dates. Across the water, the Beyoglu district slopes up to the Galata Tower and the mouth of Istiklal Cadessi, a commercial corridor that pulses day and night. Luxury hotels like the Pera Palas were built nearby to accommodate the pearl-and-poodle tastes of messieurs-dames just arrived from the continent on the Express, along with embassies and boutiques that prefaced a broad based shift to Western mores. The district could easily pass for Milan with its mod fashions and café arcades, if it weren’t for the doner kebabs dripping greasy goodness at spit roasts on every block round the clock. In the a.m. hours, night crawlers emerge from rock bars and club soirees to inhale cheap sandwiches served by men in white paper hats before catching taxis from Taksim Square — Istanbul’s electric equivalent of Times Square — back to the far extremities of the city; or ferry boats from the Karakoy Terminal to Uskudar and Kadikoy on the Asian side. A full two-thirds and counting of the city’s population hails from the poor hinterlands of eastern Turkey, putting space at a high premium. On both sides of the Bosporus, makeshift homes, or gecekondus, have been thrown up around the city outskirts by the steady inflow of rural migrants, who live vulnerable to the mood swings of the North Anatolian fault line less than 60 miles away. Ever closer to the center, ugly working-class apartment blocks now crowd the clean lines of mosques, and spider webs of electrical haywire blanket the skyline. Yet somehow the house of cards remains intact. Istanbul is still rough around the edges, but it has come a long way since Mustafa Kemal Ataturk — the beloved founder of modern Turkey — declared a secular republic in 1922. Ataturk set out to categorically sanitize every vestige of Ottoman culture, banning the fez (traditional red cap) and enforcing about-face reforms that spanned the penal code to marriage and the alphabet. Though Islam continues to provide a moral framework for many facets of private and public life in Turkey, it does so at a distance. In recent years, talk of entry into the European Union has been on every Turk’s lips. Last December, Islamist Prime Minister Recep Tayyip Erdogan finally struck a deal with the the Union to begin the accession process by the end of 2005. Critics contend that although the country has met democratic pre-conditions, much of the country is still poor and undeveloped. Supporters respond that its economy is booming, and say admission to the EU is a potential bridge between Islam and the West. Brussels may still seem far away today, but Istanbul already plays the Euro part well. Hot off their tanning beds, ersatz playboys cruise up to Riviera-style estates on the waterfront, collars to the wind; punky teenyboppers air kiss the night away to filter disco at Nis Lounge in the upscale Nisantasi district; and down the street at the Emporio Armani Caffe, hipsterati flip the pages of “Wallpaper” and “Time Out: Istanbul” with studied disaffection. However, five minutes walk in any direction and you’re bound to happen upon a smoky parlor full of old men in drab wool jackets playing backgammon, a glass of tea in one hand, shuffling prayer beads with the other. On the way, you may pass by a pair of young women in Islamic headscarves. And at dusk, no matter where you are in Istanbul, the muezzin’s call to prayer will echo in arresting beauty from minaret to minaret — a network of antennae broadcasting divine chant that no amount of high-rise development could ever subdue. Of course, if you find yourself gazing up into the ether, do not forget to look both ways before crossing the street because the infernal traffic never stops.